Elections are the festival of democracies and the same holds true for India, the world’s largest democracy. Indians, after achieving independence from the British colonialism, have been exercising their voting rights to choose their representatives through the means of elections, held at regular intervals. The period of emergency from 1975 to 1977 being the only exception to this much-extolled fact of Indian democracy. Elections are one of the most vital components and central institutions of democratic representative governments. In India, the chiefly responsible authority to conduct elections is the Election commission, an autonomous constitutional body. However, issues surrounding the debate regarding the nature of Indian democracy in general and the electoral system in particular often miss out on one important aspect that is the electoral procedure, until now. Lately, there have been allegations put up by various political parties of India including the Indian National Congress that Electronic Voting Machines(EVMs) are being tampered with ahead of polls. They further allege that the tampering favors the ruling Bhartiya Janta Party(BJP) and hence, they demand the use of ballot papers instead of EVMs in the elections. The first general elections in India were held in 1952 using the ballot papers, the obvious choice of that time and the same methodology was continued for subsequent elections until the late 1990s when the Election Commission first introduced electronic voting machines (EVMs) in India. According to the website of the Election Commission, EVMs were used on an experimental basis for the first time in 16 Assembly constituencies in the state of Madhya Pradesh(5), Rajasthan(5), NCT of Delhi(6) in the general elections of the respective Legislative Assemblies held in November 1998. Gradually the use of electronic voting machines was extended all across the country. There were several reasons behind the replacement of ballot paper with the EVMs, foremost being the cost-effective and economical aspects of the voting machines. With the introduction of EVMs, the Election Commission saved crores of rupees which were earlier being spent on the printing of millions of ballot papers for the vast population of Indian voters. 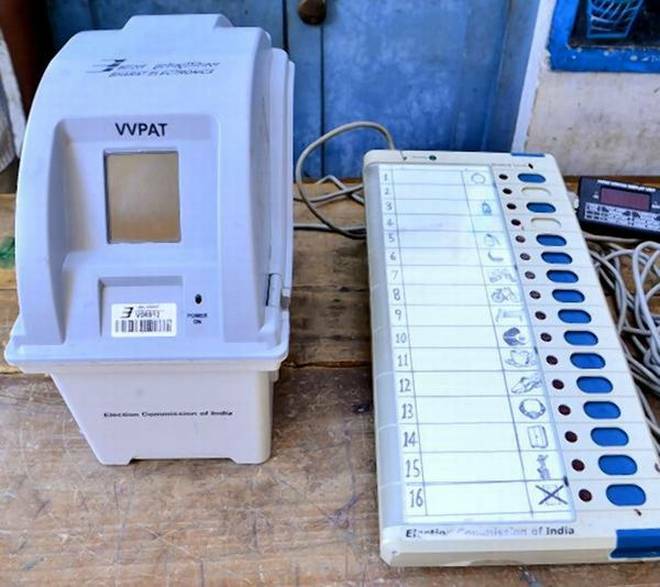 Further, unlike ballot papers, EVMs are reusable and hence suitable for one-time investment (the shelf life of an EVM is considered to be between 10 to 15 years). The EVMs are easy to transport and counting of votes is much convenient and fast, making the timely declaration of results possible.The electronic voting machines were also effective in curbing bogus voting and in reducing incidents of booth capturing which were the biggest challenges for the conduct of free and fair election in India. This is not the first time that EVMs are being opposed in India. In fact, most of the time when a candidate loses in the elections, the voting machine receives its fair share of the blame. The very first time when EVM was introduced on a pilot basis during Kerala assembly electionsin 1982, Sivan Pillai the Communist Party of India(CPI) candidate challenged the use of EVMs even before voting could be held, but the Kerala high court rejected his plea. Interestingly, Mr Pillai despite his apprehensions ended up winning. The tradition which was set on that day is being followed till today. Not every candidate who loses the poll goes to court but at least a ritualistic press conference is called by them to chide against the EVMs. However, this time, it is not just an individual questioning the credibility of the EVMs and the Election Commission. Infact, it would not be an exaggeration to say that the entire political opposition in India is suspicious towards the electoral procedure of the country. Recently there have been media reports about the malfunctioning of the EVMs in the local body polls of Uttar Pradesh. Last November, several incidents were registered in Meerut and Kanpur when votes were going to the BJP irrespective of the kind of button pressed. Several other similar incidents were also reported in different parts of the country. The Election Commission has acknowledged these incidents as merely individual cases of malfunctions and vehemently rejected the allegations of EVM hacking by the political parties by terming them as a political gimmick. The ground on which opposing political parties rest their cases is not very substantial and they even failed to provide any concrete evidence of EVM tampering in the hackathon organized by the Election Commission last year. But in a democracy, the satisfaction of the conscience of people comes first and all those political parties who are demanding to replace the use of EVMs with ballot papers are the representatives of a sizeable number of population and hence their plea demands attention.What should be the right course of action? Should the old practice of ballot papers be reverted to in place of electronic machines? India being a poor country spends a hefty sum of money on conducting elections. According to a report of “The Hindu” dated 13.05.2014, government spent Rs 3426 crore on conducting the 16th general elections and it was 131 percent more than the expenses incurred in 2009. Now if the ballot papers were introduced, then the cost is expected to go up only. Other than that ballot papers have several other disadvantages. To name a few, it is time-consuming to count them, bogus voting, wastage of paper etc. So the right course of action should be to bring more transparency in the voting process which will come with the use of “voter-verified paper audit trail” (VVPAT) along with EVMs. A VVPAT unit provides feedback to voters using EVMs for voting. The VVPAT functions as an independent verification system for EVMs and allows voters to verify whether their vote is cast as intended. A Supreme Court bench consisting of justice Ranjan Gogoi and justice L Nageshwar Rao directed the Election Commission for the full introduction of VVPAT in the next general elections in 2019. The government of India should shed its lackadaisical behavior and ensure the availability of funds to the Election Commission for the purchase of VVPAT units before the next general elections. It would be a one-time investment to ensure transparency in the voting process. After all, the faith in the system is more important than the system itself and any sum would be small to ensure the belief of the people in the democratic traditions and system of our country. Faiz Ashraf has completed his Masters in Political Science from Jamia Millia Islamia. He can be reached at faiz.ashraf786@yahoo.com.